The prefix aza- is used in organic chemistry to form names of organic compounds where a carbon atom is replaced by a nitrogen atom. The related term "deaza-" refers to when a nitrogen is removed and, usually, a carbon atom is put in its place. Sometimes a number between hyphens is inserted before it to state which atom the nitrogen atom replaces. It arose by shortening the word azote, which is an obsolete name for nitrogen in the English language and occurs in current French usage (L'azote), meaning "Nitrogen". This prefix is part of the Hantzsch–Widman nomenclature. Finasteride (left), is an aza analog of testosterone (right), with a carbon atom in position 4 (bottom left) replaced by a nitrogen atom. It's worthy to record mention of the fact that while the above fig. gives an example or 4-aza steroids, 6-aza steroids have also been developed by GSK (cf. 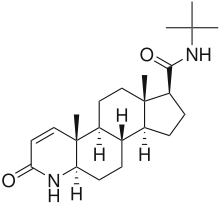 5-alpha-reductase_inhibitor), although none of these compounds, as yet, are available for sale commercially.